WOW! 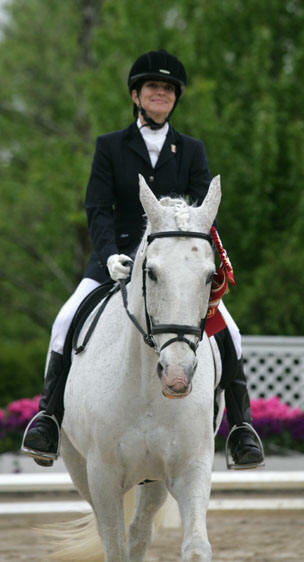 One of our Hearthstone Farm Schoolmasters has qualified for the 2010 World Equestrian Games in Kentucky!!!! When the e-mail came asking if I would be willing to loan one of my horses to a para-equestrian from Mexico who wanted to ride in an international competition held in mid-May near Chicago, my first thoughts were a jumble of questions: Would she ride well enough to be safe on one of them at the show? 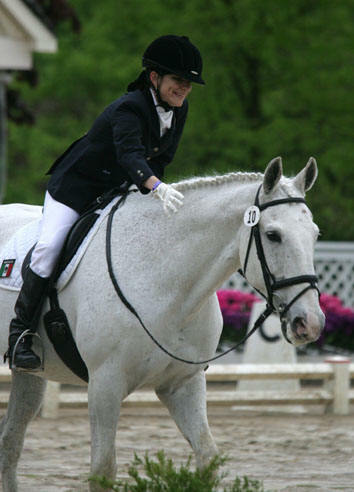 Which of my horses would tolerate and perform well for a rider with a serious disability? Could we get the passport required for international competition processed in time for a show only 6 weeks away? Do I want to go to all the trouble that this endeavor would require? I decided to explore the matter further. 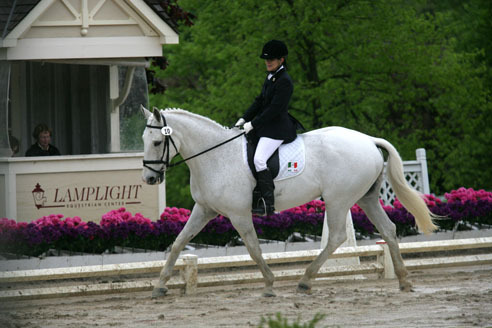 To qualify for the 2010 World Equestrian Games, para-equestrian riders (riders with various levels of permanent disability) need to earn a minimum score at an international competition. 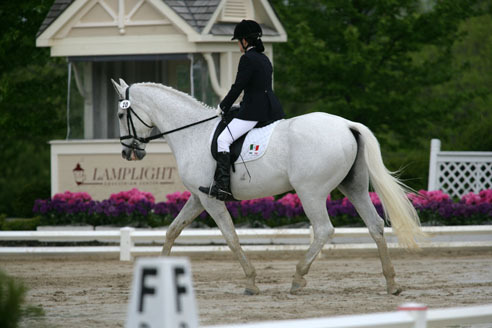 The only such horse show in North America was scheduled to take place in mid-May at Lamplight Equestrian Center in Wayne, Illinois, along with the United States Para-Equestrian National Championships. Bringing a horse all the way there from Mexico City was a bigger undertaking than rider Fernanda Otheguy could manage. She wanted to try to qualify on a borrowed horse. As we e-mailed back and forth, I started to believe the project might not be a total disaster. Fernanca has a nice Dutch Warmblood at home in Mexico City, which she competes successfully against able-bodied riders at Third Level. She sent me a video of one of her tests. Not bad! When she arrived at my stable in April to try out four of the horses, I knew we could make it work. Despite a debilitating condition that leaves her arms and legs without much strength and only limited control, she has developed her riding skills in a way that, other than strength level, she can communicate with the horses much the same way any rider can. The problem remained that she not only needed to practice two required dressage tests but also develop a freestyle in only three days, something that can take months normally. It was clear that the 17 hand gray Oldenburg gelding Riese was the best match. Fernanda sat well on him, and he listened attentively to her, trying his best to decipher her subtle aids. They started to develop a good understanding of each other. During the three days we had in April, it was clear that there would be more work to do to bring the tests up to the quality needed to earn the scores that would take Fernanda to the 2010 World Games, but the basis was there. She also made an excellent start on developing her freestyle, having me film her lessons so that she would find music to suit Riese’s gaits. During the April visit, we also started the process of applying for the passport needed to compete in an international competition. Just gathering all the information needed and starting to fill out the forms took 5 to 6 hours. It is much more complicated than what is needed for a normal horse show, and usually takes a few months to complete. It involves vet exams, inoculation records, hand-made drawings of the horse and its markings, as well as a complicated system of prerequisite paperwork. However the United Stated Equestrian Federation has a very costly but efficient option to expedite the paperwork, once the owner gets it all correctly submitted, so that was the route we pursued. Since I was to be in Europe for much of the time between Fernanda’s April visit and the show in May, my long-time student and upper level rider Jenny Schwandt was enlisted to get Riese in better show shape as well as to shepard along the passport process. We could never have done show without her! Fernanda came to the stable again three days before we were to ship to the show. We stretched the limits of Riese’s tolerance with daily sessions that often lasted an hour and a half. There was a lot of work to do, practicing portions of the tests. We also needed to revise the freestyle to meet the class specifications, and change the patterns to emphasize the movements Fernanda and Riese could do well together. She also rode another of my schoolmasters to perfect some of the concepts we were working on. Fernanda showed extraordinary focus and worked hard on every detail during those days……not only the riding, but also her plan for warm-up, her attire, grooming Riese, and even her diet. I have seldom worked with a rider so determined to search out every way to maximize her performance. Even more to her credit, she always maintained a calm and gracious exterior, despite the pressure she was under to succeed in this, perhaps her only chance to qualify for the 2010 Games. When the day came to ship to the show, Jenny Schwandt again stepped in to help with hauling the horse, then care for the horse during the competition. Riese had been shown through Intermediare II before I bought him to serve my students as a schoolmaster, but I had never seen him at a show. Luckily, his always-calm attitude at home carried over to the show grounds. He settled in and enjoyed touring the arenas with Fernanda in preparation for the first day of the show. Rain drenched the show all day Friday, stopping just a hour before Fernanda’s late afternoon ride in the Team Test competition. Riese didn’t let the sloppy footing and puddles bother him and put in a clean, correct test. Everyone was pleased, including two of the three judges. They had Fernanda placed first! A high score for another rider by the third judge on the international panel put Fernanda and Riese second in the final results, but with a score much higher than that needed to qualify for the World Games. Fernanda was on top of the world! Day Two brought high winds and cold temperatures, but again Riese went about his job in his always-reliable fashion in the Individual Test. Another second place and very good score insured Fernanda’s qualification for the World Games. We all celebrated! Fernanda was the only rider in the competition on a borrowed horse. Riders had brought their mounts from as far away as Florida, New Jersey, British Columbia, Seattle……all over the USA and three other countries! Sunday was sunny, warm and perfect for freestyle day. The many rides to music were very entertaining and beautiful to watch. When it was Fernanda and Riese’s turn, we were prepared to enjoy her ride, but had little expectation of success. They had only practiced it twice, and it was a difficult pattern, with potential for mistakes. Well, they did have some mistakes, but Fernanda’s brilliantly quick thinking turned lemons into lemon-ade. She covered her mistakes well enough that the judges place her first! She won the competition! What a wonderful finale to a great weekend! We got to hear the Mexican national anthem played as they accepted their ribbon and then did their honor round in the arena, showing off with a few steps of passage in the process. Fernanda will probably be able to bring her own horse to Kentucky for the 2010 Games, but it was Riese who helped her get there. We are very proud of them both!